Gujarat National Law University students (Udita Bhatt, Rohan George and Chethana Venkataraghvan) were the first runner’s up of this year's prestigious Manfred Lachs Asia-Pacific Moot Court Competition on Space Law, held in Beijing recently. The team also bagged the ‘Best Speaker award in the Finals’ and also the prize of ‘Best Memo’. Over two days, students from all over Asia Pacific took part in the defending fictitious cases before the International Court of Justice dealing with cases anchored in the reality of space law. The event, held at the China University of Political Science and Law (CUPL), on 23 and 24 May, 2014 included a judging panel of distinguished judges and lawyers from the region. Nirmal Mathew, Student Reporter speaks to the GNLU Team. Live Law : Congratulations on placing 2nd in the Asia Pacific Rounds of one of the most prestigious Moot Court Competitions! How was the entire experience? (Leading up to the actual moot competition and the actual competition itself)? GNLU Team : The experience is quite different from other moots. Being stretched over a period of six months and more, a team has a lot of time to ease into the moot. However the moot unlike others is extremely practical, placing a lot of emphasis on out of box thinking, unconventional arguments and space law related technicalities. This causes a team to constantly remain paranoid and keep working on their arguments. The experience by itself was beautiful, the judge panels were some of the best we have seen, with most of them not only well versed with the facts but also recent developments in space law. Live Law : Manfred Lachs is very prestigious but at the same time a very challenging moot. What made you choose the moot? GNLU Team : Well we would be lying if I said that we deliberated a lot before picking the moot. The general idea that Manfred is known to be a well reputed moot, encouragement from friends and a general leap of faith resulted in us taking up the moot. Live Law : How did the team prepare for the Moot? Did the end semester examinations and internals prove as roadblocks? GNLU Team : The general preparation by itself is not much different from how one prepares for an international law moot. However from the word go, the team tried a lot to ensure that we dealt with all the issues as practically as possible. Thus while we read our share of Bin Cheng’s and Brownlie, there was also a healthy reading of technical blogs and the like. Being a moot stretched well over 6 months, it allows students to balance their internals and examinations; however we all are grateful to our teachers for being accommodative in changing deadlines and test dates. Live Law : How did the researcher enrich the team’s effort in this competition? GNLU Team : There was no such distinction between the members in our team. ; all three of us researched, drafted, talked to, corrected and encouraged the other throughout the duration of the moot. Everyone did what was required of them (and more) to create the final product. Nonetheless, the oral rounds were a scenario where the third member was the whetstone against whom we sharpened our arguments and constantly gauged if our arguments were being bought by the judges and provided advice on how to adapt. Live Law : How were the other teams who were pitted against you in the competition? How did the Finals go? GNLU Team : As is expected from a competition such as this, the teams we were pitted against were quite good. More importantly, the judges were of such high caliber that one was forced to bring his best to the competition. We would specially like to mention the team from Murdoch University who were up against us in our semi-finals. The amount of preparation they had put in their oral and written submissions, ensured that the semi-finals were one of toughest rounds we faced. The finals by themselves were beautiful; the judges who presided were extremely qualified and insightful in their questioning. The team from NLU-D was extremely good and provided stiff competition. While we did end up as the runner up team, we managed to take away quite a few positives from the round. 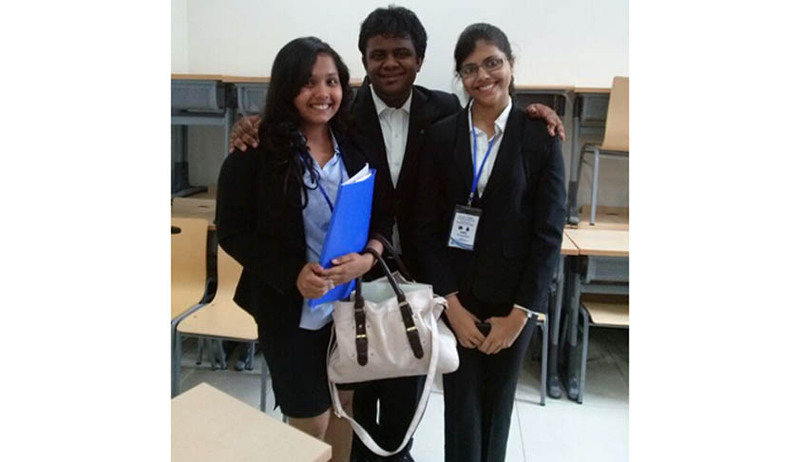 We congratulate NLU-D and wish them the best for their world rounds. Live Law : Space Law is considered as a very exciting and upcoming field of law. This year's moot competition explored a wide variety of themes such as Space Security. What did you learn from covering these themes? GNLU Team : This year’s moot problem delved basically onto state responsibility for private activities in space, compliance with ITU regulations and resultant PIL issues related with it. What we have gleaned after working nearly 9 months is that space law is quite abstract, and that no amount of reading is sufficient for one to confidently say that he has cracked an issue. Further, while space law is an upcoming field, the amount of writing on it is still in a very nascent stage, requiring reading into other fields for relevant material. Live Law : What will you take away from the competition? How has it influenced your views about space law? Have any of you decided to take up space law as a career? GNLU Team : The general lack of material on specific issues of space law, forced the team to delve deeper for understanding of issues. More importantly, when a qualified judge agrees with your view, it is a big boost and it is things like this that one takes away from this moot. Live Law : Is a moot coach necessary for such challenging moot courts? GNLU Team : It is a big boost to have someone who has earlier gone for the same moot helping you. A moot coach ensures that you get feedback from a neutral source. Further, there are several tips that only s/he would be able to provide from their previous experience; such as presenting arguments to judges, clarity of drafts written et al. Live Law : What tips do you have for others interested in taking part in mooting? GNLU Team : Mooting is one of the several activities that a law school provides, however it is not something everyone necessarily has to pursue. However, for those who really like mooting, this is possibly one of the best utilizations of a student’s five years in law school. 1) Choose a team over a moot. A moot is a big investment of time and money, having a team that you agree with on a fundamental level will ensure that the duration of the moot will be pleasant and truly enriching. 2) Keep working throughout in some way or the other. At the end of the day, most teams will have the same arguments. What will make one different is the amount of indepth reading that s/he he possesses, requiring one to read more than just the standard books. The effect of reading abstract blogs or journals is that this may help one to stand out from other teams ( since these sources provide a lot of real examples and are upto date with recent jurisprudence) , and more importantly leave a lasting impression with the judges. Live Law : Thank you so much for talking to us. We wish you all a great career ahead. GNLU Team : Thank You for interviewing us, Nirmal. The pleasure was ours. Legal News India, Law School Events, Law School News, International Moot Court Winners.